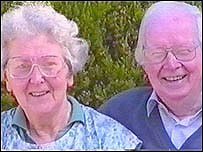 The widow of former Plaid Cymru leader Gwynfor Evans has died at the age of 86, nine months after her husband. Rhiannon Evans, who had Parkinson's Disease, died on Friday at her home in Pencarreg, Carmarthenshire. Her family said she had worked tirelessly to support her husband during his years in politics and Plaid president Dafydd Iwan called her "a tower of strength". Mr Evans, who was also Plaid Cymru's first MP, died last April, aged 92. One of Mr and Mrs Evans' seven grown-up children, the Reverend Guto Prys ap Gwynfor, said his mother was not just a supportive wife, but a caring mother with a "wonderful sense of humour". He added: "She was a member of Plaid Cymru before my father and was regarded by him as the embodiment of Welshness." Mrs Evans was born in Liverpool, although her family was originally from Meirionnydd and Anglesey. "She supported my father in everything he did and was a person of great conviction," said Reverend ap Gwynfor. "My mother also had a wonderful sense of humour and she would use it to bring my father back down to earth when he was in one of his idealistic modes." Mr Iwan said: "Rhiannon Evans was a tower of strength in Gwynfor Evans' life, as well as a great woman in her own right, and it is with great sadness we learn of her passing, after suffering a long illness bravely and without complaint. "The great love that was so evident between Rhiannon and Gwynfor and their children and grand-children was a constant inspiration to all who knew them, and the dignified manner with which she bore her long illness was beyond words. "Wales has lost one of her bravest and most dedicated women, and our sympathy extends to all the family in their hiraeth."